I now understand that New York cabdrivers — and New Yorkers in general, I guess — think of their city as a series of intersections rather than as street addresses. I get it. But at this particular moment, I still had a problem: namely, I didn’t know the cross-streets of my destination. “Oh, forty-seven,” he said, nodding, as if I’d been speaking Dutch up until this point. 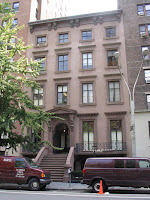 “That’s down at Fifth and 12th, Greenwich Village. Why didn’t you say so?” Grrrr. And off we went, down Fifth Avenue in Friday rush hour traffic, careening around stopped buses, scooting around pedestrians, and squeezing between slower traffic in lanes that didn’t exist. New York City landmarks rushed by on my right — the New York Public Library, the Empire State Building (I craned my neck out the window to look up at that one), the Flatiron Building — until suddenly we stopped in front of a beautiful brownstone walkup, directly across from an imposing old Presbyterian church. I had finally arrived at the Salmagundi Club — and thanks to a cabdriver who clearly had no respect for the laws of traffic, physics or gravity, I had arrived quickly, relatively in one piece, and with plenty of time to spare before my 6:00 talk. I greeted the staff, and checked out the room where I’d be speaking, a classy Victorian-looking parlor with wing-backed chairs and antique furniture. I camped out on the front steps to wait for Casey, my Patient Editor, and struck up a conversation with a very nice gentleman, who eventually asked me what I was doing in New York. I told him I was speaking at the club in about ten minutes, and he suddenly beamed proudly — he said he had made the trip from uptown just to hear me talk, and asked if he could shake my hand and take a picture, a request that still rocks me back with disbelief. As I say often, it’s just me, and I can’t believe anyone wants a picture of themselves with me and my giant pumpkin head. But naturally, I obliged — and right on cue, with my lone fan snapping away, here came my editor, Casey, with her colleague, Tessa. I hadn’t seen Casey in person since the Book Expo in Washington, DC, more than two years ago (at that time, I made what I’m sure was a great first impression, as I knocked down her rack of catalogues when I reached out to shake her hand). Since then, we had written, edited, and produced Washington Irving — an experience that, for the rest of our lives, inextricably links us together. And it was absolutely great to see her; Casey is one of those people who bubbles with enthusiasm about her projects and her authors, and she’s at once your biggest fan, best critic, and most patient counselor. As I think any writer might attest, the best author-editor relationship is built on trust — you are, after all, putting yourself and your work completely in someone else’s hands — and I’ve trusted her completely since Day 1 of the project. But now she was here, in her dual role as my editor and as Arcade’s publicist, to see me talk about “our boy,” as we’ve always called Irving. In other words, she now was putting her trust in me to make us look good, and I wanted to do us proud. And just like that, I was nervous. Turns out I wasn’t the only one. To her surprise, Casey was asked to introduce me to the crowd of 20 or so that had gathered in the parlor — an easy enough task when you know its coming, but somewhat daunting when you’re suddenly put on the spot. Still, Casey did a fine job of it, telling a story I’d not heard before about the first time my agent pitched the Washington Irving project to her. It was all so interesting — and her enthusiasm was so sincere — that by the time she called me to the podium, I’d completely forgotten to be nervous. I spoke about twenty minutes, giving them an overview of Irving’s Salmagundi magazine, from which the club had taken its name in 1871, and wrapped up by talking about Irving’s life among artists. I took a number of questions afterwards — there were quite a few about Irving’s views on religion, money, and John Jacob Astor — then signed and spoke with people for another twenty minutes or so. Afterwards, Casey and I were then given a quick tour of the place, allowing us to gawk at the paintings in the stairwell and the old books in the library. That evening, Casey took me to dinner at Fatty Crab, a funky Malaysian restaurant over in the Meatpacking District. (“Any place with the name ‘Fatty’ in it sounds good to me,” Casey had said earlier — a remark only the rail-thin Casey can make with impugnity.) The place was noisy, so we had to sit next to each other, rather than across from each other, to be heard and typically, we sat chatting until a waitress chased us away, declaring (quite fairly) that others were still waiting to be seated. Next, the two of us walked over to the Terribly Fashionable Gansevoort Room, a rooftop bar and restaurant accessible only by an Exclusive Goodfellas Elevator, with a great view of the city, and a loud and trendy New York crowd. We took up a post on some low benches close enough to hear each other over the din, and remained in animated conversation until (once again) a server shooed us away, saying they needed the room for a private party. At that, I checked my watch and saw it was 11:45 p.m. There are times when this would have been an ideal time for a change of venue for another few hours — and I do believe Casey could have stayed out until the wee hours as it was. But I’d been up since 5:30 a.m. — and now, I was just plain tired. We stumbled out into a New York night that was still vibrating with activity and hailed a cab. Casey provided a quick primer on the meaning of New York Geographical Terms like West Side and Upper East Side as we sped back up the island. Our cab driver had misheard my directions (in which I was very careful to say “52nd and Madison Avenue”) and dropped me off at the corner of Madison and 56th, but it was a beautiful night, and I didn’t mind the walk. I unlocked to door to my room to find my bed turned down, soothing music and video playing on the television, and a chocolate chip cookie and bottle of Yoohoo on the desk. Point scored, Omni Berkshire. I called my wife to tell her good night (we always do that when one of us is on the road, no matter how late it might be), uncapped the Yoohoo, took a sip, and remembered why I don’t like Yoohoo. It tastes like Quik in water. I reset the clock on the bedside — I wasn’t going to get stung by that again — and rolled up in the comforter. Day One of my New York Tour was over. This entry was posted in book signings, My Patient Editor, New York, Salmagundi and tagged book signings. Bookmark the permalink. Sounds like fun after the transportation issues.